The smell of lemon is associated with clean. Lavender has that property also to some extent, but with the way L’Occitane Shea Butter Extra Gentle Soap cleans, Verbena makes my skin feel sterilized. This is the same gentle, well-cleaning soap that I’ve been raving about, its core formula is unchanged. For simplicity’s sake, I will summarize the different scents below. Milk: shea butter, musky scent; unisex (leaning a bit towards feminine); doesn’t change the scent of women’s fragrance in my experience. Lavender: a light, lavender scent; masculine; accentuates the smoky quality within some women’s perfumes. Verbena: lemon scent, for a superior feeling of clean; especially great for hot days; feminine; accentuates citrus and lighter notes in women’s fragrances. My personal preference is for Milk – it makes me feel at home in my skin. Verbena will be indispensable should the summer be very hot. Having liked L’Occitane’s Shea Butter Extra Gentle Soap in Milk, I decided to try the Lavender-scented option. It cleans just as well and I haven’t noticed any difference in it’s properties despite the shorter list of ingredients (as depicted on Sephora.ca). The scents coming from both Milk and Lavender are strong and not all that pleasant, but the fragrance they leave on the skin is barely there and a lot more agreeable. Lavender’s scent is distinctly lavender and is detectable when smelled directly from the skin, not at a distance. For me, the scent of lavender is associated with cleanliness so I feel more refreshed than with Milk, yet both wash just as well. Escentual.com increased their prices for the soap by 25% since the last review. 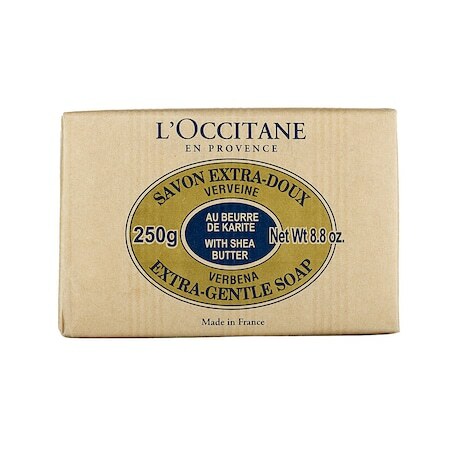 L’Occitane Shea Butter Extra Gentle Soap: 8.8oz (250g) for C$14.00 @ Sephora.ca. 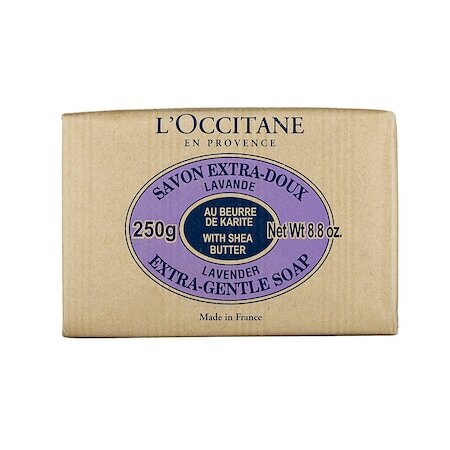 L’Occitane Shea Butter Soap: 100g for £4.50, 250g for £7.50 @ Escentual.com. I’m always looking for something better. I’ve trusted in products sold at Sephora because I found them to be better than most drugstore brands. However, after the disappointments with Tarte (Pure Maracuja Oil and Maracuja C-Brighter Eye Treatment), I was afraid of purchasing something I had not tried before. Of course, I do my regular research before any blind purchase, but it failed me twice. Consequently, I was weary of purchasing unfamiliar products. I shouldn’t have worried about L’Occitane’s Ultra Rich Body Cream. Firstly, L’Occitane is a proven brand, producing quality products with healthy ingredients. Ultra Rich Body Cream contains 25% shea butter. Despite my previous experience with shea butter scents, which smelled dirty, the smell of this cream is soft and unobtrusive. It is pleasant: powdery and slightly rosy. Compared to Philosophy Amazing Grace Firming Body Emulsion, Ultra Rich Body Cream requires more work in spreading due to a more viscous consistency. Although I did state that Amazing Grace can be used on the face, it can be irritating if the skin is dry or damaged. L’Occitane’s Ultra Rich Body Cream does not irritate. It absorbs well and can be used on the face for people with dry skin. I did not have shiny or oily skin after its use (given time for absorption). It’s ability to moisturize is greater than Amazing Grace’s, although the latter is already a fantastic hydrator. Fragrances last longer using Amazing Grace, while the tenacity of scents on Ultra Rich Body Cream is average – it does not smother fragrances (like The Body Shop Body Butter) nor does it prolong them. I highly recommend Ultra Rich Body Cream Rich in Shea Butter for people with dry skin or for cold, dry seasons. It’s non-irritating, pleasant-smelling, and can be used on the face. Because of its viscosity, a container of Ultra Rich will not last as long as the same-sized container of Amazing Grace. For sensitive skin, Ultra rich is a better bet. Amazing Grace will serve well the rest. 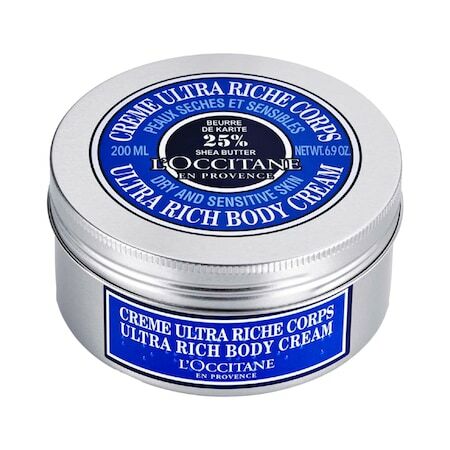 L’Occitane Ultra Rich Body Cream Rich in Shea Butter: 7oz (200ml) for $48.00 @ Sephora.ca. When I purchased Body Emulsion, I was looking for a moisturizing cream or lotion that wasn’t greasy, could be used in both summer and winter, yet provided enough moisture for the skin not to feel dry in the cold months. I also wanted a scent that was light and did not interfere with my fragrances. Amazing Grace Firming Body Emulsion is the best body lotion I have come across. The only thing I would change in it is to make its musky scent a lighter – then, it would be perfect. Now, it is 99% perfect. Even so, it does not interfere with my fragrances and I noticed that it even extends their longevity by as much as 2x, depending on the perfume. The lotion contains the magic ingredient of shea butter, an emollient on trend and for good reason. It also contains macadamia nut and olive oils. The cream moisturizes the body, dry regions like hands and feet, and is gentle enough even for the face without causing acne or sensitivity. Its a true all in one. Highly recommended for all ages and skin types. Philosophy Amazing Grace Firming Body Emulsion: 16oz (470ml) for C$44.00, 24oz (710ml) for C$53.00, 32oz (950ml) for C$69.00 @ Sephora.ca.